Washburn Rural scored on a 13-yard touchdown pass from Jordan White to Jaylen Carter with under 90 seconds remaining and survived a final Emporia drive to pull out a 28-24 road win. Emporia drove inside the Washburn Rural 10-yard line late in the game, but could not connect on four consecutive pass attempts into the end zone. After missing much of last season due to injury, White returned to guide the Rural offense and rushed for two touchdowns while passing for two more scores. White finished with 137 yards passing and 93 yards on the ground. Emporia was led by Gabe Galindo’s 153 yards rushing. Gardner-Edgerton began the Ryan Cornelsen era and the transition to the Sunflower League with a 28-23 upset of Class 6A No. 5 Shawnee Mission East. In doing so, the Blazers snapped a 10-game losing streak that dated back to the 2016 season. Shawnee Mission East led 16-14 in the fourth quarter until Gardner-Edgerton quarterback Teven McKelvey gave the Blazers the lead for good with a touchdown run. On the next series, Teven Ewbank picked off a Lancer pass and returned it for a touchdown and a 28-16 Blazer lead. Shawnee Mission East would score with under two minutes remaining, but could not get the onside kick. Gardner-Edgerton has given Shawnee Mission East trouble in each of the past two seasons in the playoffs. The Lancers defeated the Blazers 36-35 back in 2016, and 42-28 last season. Wichita West blasted Hutchinson 55-14 in a game played at Friends University. The Pioneers scored twice in the final minute of the first half to turn a 14-14 tie into a 28-14 halftime lead. The second half was all West as the Pioneers scored three times in the third quarter to pull away. West quarterback Zion Parks rushed for four touchdowns in the victory. On Thursday night, Wichita North defeated Wichita South 29-22 to snap a 21-game losing streak. Prior to that victory, the Redskins last victory came October 15, 2015 in a 22-5 win over Wichita East. The victory takes Wichita North from the longest losing streak in Class 6A to now tied for the longest win streak – 1 game. Shawnee Mission South opened the season with a victory over rival Shawnee Mission North for a second consecutive season. The Raiders won this year’s meeting 23-0 behind a solid performance from senior quarterback Jack Roberts. Roberts rushed for 111 yards and passed for 44 yards and a touchdown to Will Huggins. The Raider defense contributed two touchdowns on an interception return by Sidney Hales and a fumble return by Parker Minnick. Salina Central ended its 18-game losing streak with an emphatic 44-7 win over Goddard-Eisenhower. The Mustang’s senior back Taylon Peters rushed for 188 yards and three touchdowns and also kicked a field goal. Quarterback Jackson Kavanagh passed for 200 yards and two more scores for Salina Central. St. James Academy raced out to a 41-0 halftime lead in topping Blue Valley Northwest, 41-20. Thunder quarterback Jack Moellers passed for 221 yards and two scores and added 115 rushing yards and another touchdown. De Soto won the inaugural league game in the new United Kansas Conference with a 42-7 decision over Leavenworth. 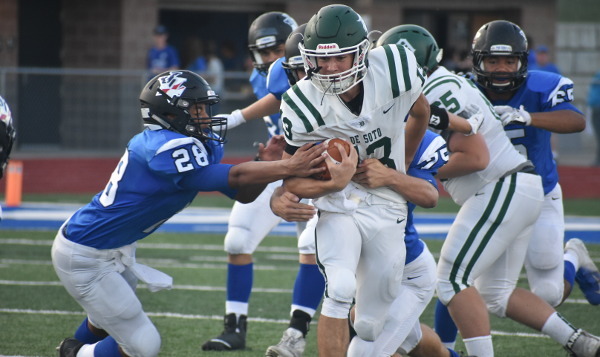 Sophomore quarterback Jackson Miller rushed for 117 yards and two scores while passing for more than 100 yards and a touchdown pass to Connor Flynn. De Soto overcame six lost fumbles while breaking in several new starters. Joey Oplotnik rushed for two scores for the Wildcats. Leavenworth scored on a fumble recovery in the end zone when De Soto was backed up against their goal line. Great Bend went on the road and picked up a solid 35-12 victory over Andover. The Panthers were led by senior quarterback Koy Brack who completed 18 of 30 passes for 260 yards and two scores. Brack tossed both touchdown passes to junior Alex Schremmer who hauled in eight receptions for 181 yards. Brack also rushed for two scores and 53 yards. The Panthers were led on the ground by Gage Fritz’s 68 yards and one touchdown. Topeka Seaman used eleven different ball carriers in a 56-8 victory over Topeka Highland Park. The Vikings rushed for 281 yards on 31 attempts and eight touchdowns. Sam Payne, Kobe Jones, and Christian Beauchamp each rushed for two touchdowns, while Blake Smith and Caeden Meredith ran for the other two scores for the Vikings. Newton used touchdowns on defense and special teams to build a lead on Buhler, then held on to beat the Crusaders, 34-26. The Railers led 27-0 in the first half thanks to two Colton Davis touchdown runs, an Isaiah Presley punt return for a score, and a pick-six by Matt Seirer. Buhler closed the gap to 20 in the second quarter. Newton threatened again late in the half, but Buhler’s Austin Gentry intercepted a Newton pass and returned it 88 yards for a score to cut the lead to 27-13 at halftime. Davis scored again for Newton in the third quarter, but Buhler added two touchdown receptions from Gentry to close to the final margin. Andover Central opened the 2018 season with a 13-3 road victory over nearby Augusta. The Jaguars were led on offense by Ty Herrmann’s 129 yards rushing on 25 carries. R.J. Bethea rushed for a touchdown and Peyton Jensen caught a touchdown pass from Chase White to account for the Andover Central touchdowns. Sophomore La’James White rushed for 163 yards and a pair of touchdowns as the KC Piper Pirates made their Frontier League debut with a 28-7 victory over Eudora. Quarterback Dalton White helped the Pirate cause with 132 yards rushing and a touchdown. Dalton White also passed for 85 yards. Gavin Elston scored Eudora’s touchdown on a short run, while Carter Neis rushed for more than 100 yards for the Cardinals. Wellington defeated Wichita Collegiate for the first time in school history on Friday night, and did so in dominating fashion. The Crusader defense held Collegiate to 90 yards of total offense in the 32-0 shutout. Michael Ledbetter passed for 217 yards and two touchdowns only six completions. Ledbetter connected with De’Andre Washington on two touchdown passes over 80 yards. Zach Flowers rushed for a pair of touchdowns as Baldwin opened Frontier League play with a 35-7 victory over Ottawa. The Bulldogs led 14-0 at halftime thanks to a Jake Grossner run and Flowers’ first touchdown. Ottawa pulled to within a score in the third quarter on a Brandon Carlson touchdown catch from Jackson Allen, but Baldwin would answer with three consecutive scores to close out the victory. Chanute scored 17 points in the fourth quarter to pull away from Towanda-Circle in a 31-8 victory. The Blue Comets led 14-0 through three quarters before the scoring picked up. Junior quarterback Ty Bowman completed 23 of 34 passes for 278 yards and three touchdowns to lead Chanute. Bowman connected with Corbett Kimberlin 11 times for 133 yards and two scores. Lane Harvey also has 49 receiving yards and a touchdown, while Garrett Almond had four catches for 63 yards. Easton Barrier rushed for 62 yards and a touchdown to lead Circle. Perry-Lecompton opened the season with a 68-0 blanking of Royal Valley. Quarterback Dalton Kellum rushed for 166 yards and four touchdowns to lead the Kaws. Perry-Lecompton rushed for more than 360 yards on the night. Colton Mallonee caught a touchdown pass from Kellum and returned a punt 60 yards for another score. Chapman opened the season with an impressive 34-18 victory over last year’s Class 3A runner-up Marysville. The Irish were led by senior quarterback Izek Jackson’s 275 rushing yards and five touchdowns on 26 carries. Chapman rushed for 342 yards in the game while averaging 7.3 yards per carry. The Burlington Wildcats may have answered some questions about replacing the production of Kpreps All-State selection Connor Jeffers. The Wildcats defeated Council Grove 42-8, and got 200 yards and two touchdowns on the ground from junior Cael Johnson. Johnson amassed his 200 yards on only eight carries and also threw a 35-yard touchdown pass to Eric Famion. Both of Famion’s receptions in the game went for touchdowns totaling 45 yards. Brannon Nordstedt added 85 yards and two scores for Burlington. Halstead opened Central Kansas League play with a solid 22-7 victory at Nickerson. The Dragons rushed for 258 yards in the game led by junior Scott Grider’s 160 yards and a touchdown. Sophomore Kaden Lopez added the other Halstead score as part of his 55 yards on the ground. Smoky Valley opened with a dominating 46-7 home victory over Larned. The Vikings grinded out 384 yards on the ground in the victory. Senior quarterback Lane Schrag led the offense with 146 rush yards and two touchdowns. Schrag also passed for 36 yards including a 16-yard touchdown pass to Tim Lambert. Lambert also contributed 90 yards rushing on 11 attempts. Hesston opened with a 42-36 victory versus Hillsboro. The Swathers led 26-12 at halftime and had a 42-28 lead with 1:50 left to play after a 45-yard touchdown run from Parker Roth. He had 14 carries for 198 yards and four scores. Jacob Eilert, in place of all-stater Cameron Cox, had 9 of 14 passing for 126 yards and two scores. Hillsboro quarterback Jorge Hanschu had a big opening game with 16 of 28 passing for 251 yards and five scores, along with 25 carries for 113 yards. Hillsboro outgained Hesston, 449-418. In a game moved to Great Bend, Russell defeated Ellsworth, 24-13, to open NCAA play. The City of Russell had experienced a power outage late last week, and relocated the contest 40 miles south to Great Bend. Ellsworth led 6-0 early, and then Russell tied the score shortly thereafter for a 6-6 tie at the end of the first quarter. Then, Travis Tammen had an 11-yard interception return for a score and a 12-6 lead. Ellsworth took a 13-12 lead before Russell scored 12 unanswered in the third quarter. Russell, known for defensive touchdowns last year, had a 51-yard fumble return for a TD for the game’s final score in the third quarter. Russell outgained Ellsworth, 251-165. Russell finished plus-1 in turnover margin in a game had seven turnovers. Southeast-Cherokee ended a 28-game skid with a 20-6 victory over Uniontown. Junior Jakob Tavernaro rushed for 130 yards and a touchdown on 17 carries to lead the Lancers. Bryce Petersen added 50 yards and a score as part of Southeast’s 252-yard rushing output. Senior quarterback Bret Malle also passed for 130 yards. Southeast, in its first season in the Three Rivers League, had not won since defeating Northeast-Arma 27-20 back on October 10, 2014. Rossville scored two fourth-quarter touchdowns to pull out a 26-14 road victory over Centralia. Garrett Carver led the Bulldawgs with three rushing touchdowns and 195 yards on the ground. Centralia, which entered the season ranked No. 2 in Class 1A, was led by junior Kamble Haverkamp’s two rushing touchdowns. Atchison County snapped a 19-game losing streak by beating Oskaloosa, 46-0. The Tigers led 38-0 at halftime en route to the blowout win. Atchison County is in its first season as a member of the Northeast Kansas League after switching from the Big 7 Conference. Lakin defeated Meade, 20-19, in a key Hi-Plains League contest. The Broncs led 12-0 at halftime. Kayden Christiansen had a big game with 185 rushing yards. He delivered a 44-yard touchdown run for the first score and a four-yard run in the second half. Lakin led 20-6 entering the fourth quarter before Meade scored twice in a four-minute span. Last year, Lakin trailed Meade, 28-0 at halftime before 30 straight points and a 30-28 victory. Humboldt opened with a 48-6 victory versus Neodesha. The Cubs had 398 rushing yards, and senior Dagen Goodner completed 4 of 6 passes for 69 yards with a touchdown. Junior Conor Haviland had eight carries for 176 yards and three scores. Goodner also rushed 10 times for 132 yards and a pair of scores. Entering this year, the Cubs were 2-7 in the last nine meetings against Neodesha. Southeast of Saline, expected to be improved this year, opened with a 39-0 victory against rival Sacred Heart. Southeast of Saline won its fifth straight against the Knights, though the previous two meetings came by a combined 13 points. Both Jaxson Gebhardt and Seth Eklund played at quarterback for the Trojans. Charlie Skidmore, Sacred Heart’s top receiver, was hurt early when the Trojan lead was 6-0. The Trojans’ defense held Sacred Heart to 7 of 20 passing for 33 yards. Troy earned a 27-12 victory against Valley Heights. Reid Jasper had a 41-yard receiving score and a 40-yard touchdown run. The game was scoreless after the first quarter. Valley Heights defeated Troy, 59-26, last year. Inman halted its 10-game losing streak with a wild overtime victory over Belle Plaine. The Teutons came from behind to tie the game at 30 and force overtime. Belle Plaine got possession first in overtime and scored to take a 36-30 lead. The Dragons elected to go for the two-point conversion which was stopped by the Teuton defense. Inman scored on the first play of its possession and successfully converted the PAT for the 37-36 victory. In the year’s only matchup of Central Prairie League 11-man teams, La Crosse beat Ellinwood, 48-0. The Leopards, without running back Christian Suppes, had big games from junior Keldon Day and freshman Colby Stull. Day had 131 rushing and two scores, while Stull collected 102 rushing yards. Junior quarterback Hunter Morgan accounted for three touchdowns. Pleasanton, an Eight-Man, Division II playoff team last year, moved back up to 11-man football and opened with a 42-14 victory against Northeast-Arma. Quarterback Kaden McKee completed 18 of 28 passes for 371 yards and five scores. Kasen McKee collected 11 catches for 230 yards and four scores and picked off two passes on defense. Pleasanton recorded more than 600 yards of offense. Ell-Saline opened with a 48-7 victory versus Sterling in Heart of America action. The Cardinals led 27-0 entering halftime and 41-0 after three quarters. Nick Davenport had another big game with 11 of 16 passing for 134 yards and two scores, and tallied seven rushes for 124 yards and two scores. Ell-Saline finished with 429 total yards of offense, including 295 rushing. Last year, this game was not finished and not considered an official game due to weather. The Maranatha Academy Eagles made their debut in 8-Man football with a 72-22 victory over Kansas City East. Quarterback Nate Burdette rushed for two touchdowns and passed for a pair of touchdowns to Brock West. West also rushed for a score and returned a kickoff for another touchdown. Valley Falls and Onaga have played some wild games in recent years. Remember Onaga’s 114-68 victory over Valley Falls in the 2016 season finale? Friday night was no different. This time it was the Valley Falls Dragons coming out on top 54-48 in overtime. With the win, the Dragons snapped a 17-game losing streak that dated back to Week 1 of the 2016 season. Moundridge won its inaugural eight-man game with a 42-6 victory against Goessel. The Wildcats scored on the game’s first possession and opened the contest with 42 straight points. Moundridge ran 50 times for 229 yards and five scores. Cody Hazelton and David Kaufman combined for 23 carries for 148 yards and two scores. Caldwell raced out to a 38-0 halftime lead in beating South Haven, 56-8. The Blue Jays were led by Corbin Rice who rushed 15 times for 156 yards and four touchdowns. Rice also passed for 97 yards and a score to Jalen Risley. Dru Volavka added 71 yards rushing and a pair of scores. South Haven managed only 17 rushing yards on 35 attempts. Argonia-Attica opened with a solid 44-16 victory over Hutchinson Central Christian. The Titans led 20-14 after the first quarter and 26-14 at halftime. Blake Harnden rushed for 69 yards and three touchdowns for Argonia-Attica. Harnden also caught a touchdown pass. Central Christian lost during the regular season for only the second time since returning to KSHSAA-sanctioned football in 2016. In its first game in eight-man football and the Matt Fowler era, Oswego defeated rival Chetopa, 54-14. The Indians transitioned to the single wing that Fowler ran to great success at Spearville. Sophomore Isaac Elliott had 14 carries for 114 yards and two scores, and junior Jace Wilson delivered 14 carries for 91 yards and two TDs. All of the Oswego’s yards came from non-seniors. Chetopa’s losing streak dropped to 13 contests. Spearville opened the Travis Callaway era with a solid win, 52-6, against Satanta, considered an upper-tier Division II school entering this fall. Last year, Satanta went 7-2 and lost to Spearville in districts. Senior quarterback Kolby Stein completed 6 of 8 passes for 126 yards and three scores. Junior Carson Rich had 15 carries for 187 yards and three TDs. Spearville has a key game against South Central this week. West Elk started the season with a 50-14 victory against Marmaton Valley. The Patriots rushed for 257 and passed for 82. Senior William Silvey completed 5 of 6 passes for 82 yards with three scores. He rushed 17 times for 70 yards and three TDs. Junior Nic Moreno had 19 carries for 161 yards and a TD. Triplains-Brewster stopped its 11-game losing streak with a 32-22 victory over Logan-Palco in Week 1. Senior Dakota Enslow paced the Titans with 177 rushing yards and two touchdowns. Enslow also passed for 169 yards and a pair of touchdowns to classmate Aaron Platt. Wheatland-Grinnell transitioned back up to Eight-Man, Division II from six-man football and opened with a 46-0 victory against Fairfield. Trey Vincent passed for 225 yards and three scores. Andrew Taylor rushed for 83 yards and three TDs. Centre-Lost Springs opened with a 50-14 victory against Peabody-Burns. The Cougars led 36-6 at halftime and recovered four fumbles in the game. All seven of Centre’s touchdowns came on the ground, including four at seven yards or fewer. The Cougars had a 22-13 first down advantage and a 237-111 edge in rushing yards. Northern Valley opened with a 50-48 overtime win in the annual season opener against Alma (Neb.). Senior Nick Stutsman, in his first game at quarterback, completed 12 of 18 passes for 166 yards with a 2/3 TD/INT ratio. He led with 23 carries for 93 yards, both team-highs, and tied for the team lead with two rushing scores. Senior Ross Cole had six catches for 80 yards and a pair of TDs and picked off a pass. Stutsman led with 16 tackles. Alma led 22-14 at halftime. The Huskies outscored Alma 12-6 in the third quarter, 16-14 in the fourth and 8-6 in the overtime. Northern Valley has a 4-3 advantage in the last seven meetings, including two straight victories. Waverly defeated rival Lebo, 42-14. Waverly, in the final season under legendary coach Mike Hevel, scored the first 22 points of the game and led 28-8 at halftime. Senior Kade Scott rushed for 173 yards and three touchdowns as defending 6-Man champion Pawnee Heights opened with a 49-0 shutout of Western Plains. Golden Plains opened with a 48-0 shutout of Deerfield in a game that ended at halftime. The Bulldogs have posted a 13-6 since switching to 6-Man, while Deerfield was playing its first game in the 6-Man ranks. Ashland transitioned to the 6-Man ranks with a 52-0 win at Natoma. Junior Brennan Grady passed for 99 yards and two touchdowns, while sophomore Gage Branson led the team with 69 yards on the ground. Wichita Homeschool opened the 2018season with a 49-0 shutout over Veritas Christian. The Warriors scored 27 points in the first quarter. Five different Warriors scored in the game. Veritas Christian is now 0-2 on the season after a 64-6 opening loss at Albany (Mo.) on August 24th. Christ Prep Academy moved to 2-0 on the season with a 41-0 victory at Wabaunsee. Freshman Shay Jenkins led the Patriots with 104 yards rushing and a touchdown on 15 carries. Jenkins also caught a touchdown pass from Noah Blair. Senior Connor Hurley also added 74 yards on the ground. Blair, Luke Sato, Grant Stamatis, and Micah Krause each added scoring runs for Christ Prep. The Patriot defense held Wabaunsee to 25 yards of total offense.